Chittoor District Work Adjustment Teachers List SGT, SA and LP: Chittoor District School wise Mandal Wise and Subject wise Work Adjustment Teachers Lists. School Education teachers working under various management Government, Zilla Parishad, Mandal Parishad adjustment of surplus teachers in need schools - regarding. 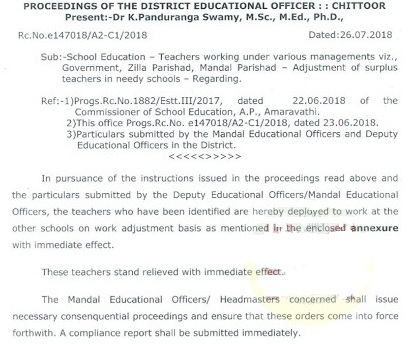 In pursuance versions of the instructions issued in the proceedings read above and the particulars submitted by the deputy educational officers/ Mandal education officers, the teachers who have been identified or hereby deployed to work at the other schools on work adjustment basis as mentioned in the enclosed annexure with immediate effect. These teachers stand there lived with immediate effect. The Mandal education officer/Headmasters concerned shall issue necessary consequential proceedings and ensure that these orders come into force for with a complaints report shall be submitted immediately. Chittoor District SGT, SA and LP Work Adjustment Teachers List Download.